Baseball Rebellion Hitting Instructor Tyler Zupcic came to me with a throwing problem. He was complaining about shoulder pain, that had now moved down to his elbow and forearm, as he kept throwing batting practice in his lessons. One day out of the blue he showed up to work with an odd black and blue mark on the inside of his throwing elbow. He asked me to watch him throw and see if there was anything mechanically I could help him with. I immediately saw the reasons for his arm troubles. Tyler was an outfielder at Appalachian State where he never experienced arm pain but had a long arm swing with a big stride. When throwing BP behind an L screen it is not the same timing of arm swing to stride. What that means is when a thrower's front foot hits the arm position should be 90 degrees cocked behind the head. The reason this position is important is that the upper body is able to rotate the shoulder more direct to the target instead of horizontal. 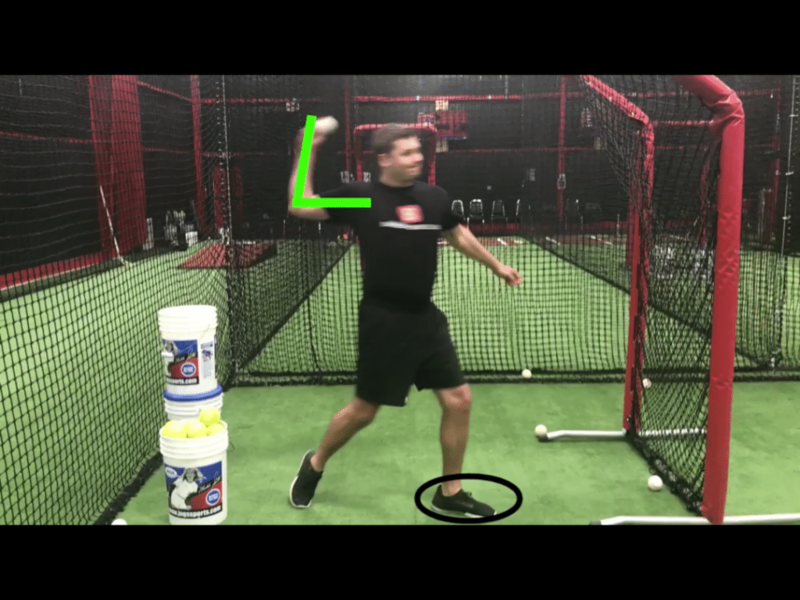 (Check out an article on why Horizontal Rotation is bad and drills to correct it. 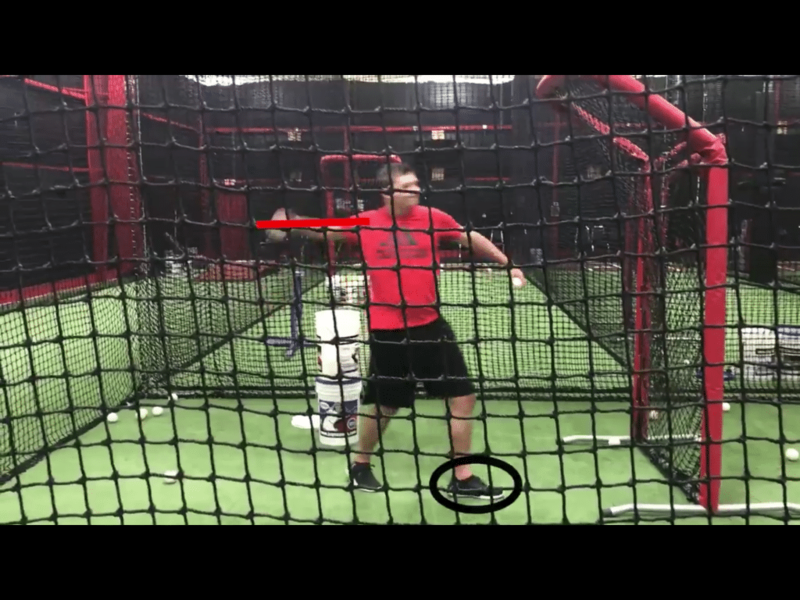 https://baseballrebellion.com/dshinskie15/how-to-stop-kids-from-throwing-sidearm/ ) You can see in the picture below the position of his arm at front foot strike is at 0 degrees. As you can see from the picture above, the ball did not get above his elbow before his foot is firmly in the groud. This is the culprit of his pain. The forearm cannot get to safe external rotation when in this position. 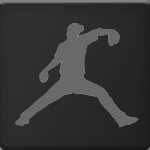 As he moves into the throw his forearm drags behind body rotation, which causes stress on the elbow. He gradually increased his arm action by focusing pre-throw on one simple thing and then executing the task. He increased on day 2 to about 60 degrees seen in the picture below. After day 2 he started to grasp the concept and the feeling of timing up his arm swing with the front leg. With a simple cue of feeling his arm get to 9o degrees behind his head, Tyler was able to relax more and allow his arm to safely wipe. Again the reason I wanted him to get to this position, is because the arm is more supported. By Tyler using more of his body as he is rotating his shoulders at the target, his arm is in a more supported position. What I mean by "supported" is that the arm can move safely and freely with the body to cause less stress on the small muscles in the elbow and shoulder. 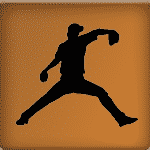 When the arm is in a supported position, he is able to throw more consistently and safely. After day 3 you can significantly see the difference in where the arm is positioned as his front foot hits. 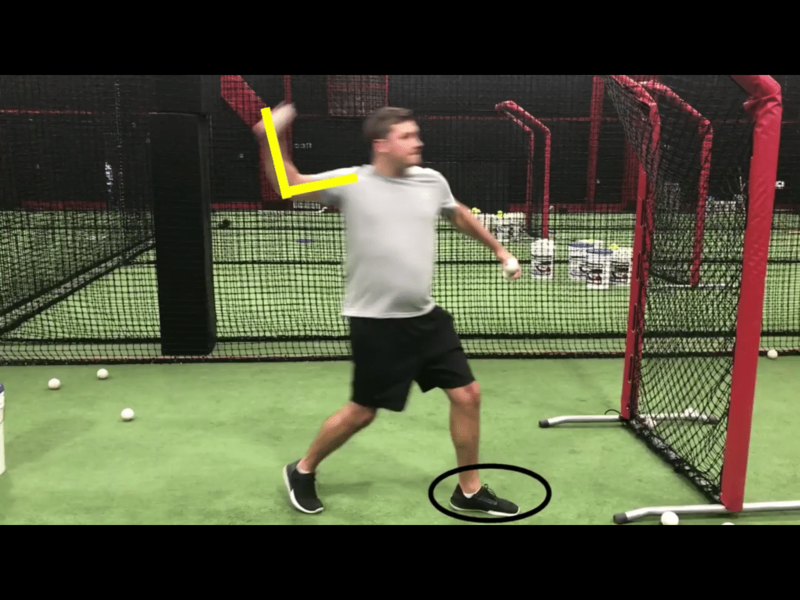 After we fixed his arm action Tyler instantly was able to throw harder, more accurately and with no pain to his clients. Although this was obviously a must fix for Tyler because of our profession here at Baseball Rebellion. Parents and coaches can make these simple cues to help throw more pain-free and more accurate batting practice for their kids and teams. Here is a video of the difference from day 1 to day 3. Like what you heard from Dave? Try out an online evaluation or lesson from him! I am confuse as to which is correct. One thing we take a lot of pride in at BR is adapting and evolving as we go. Our oldest information was our best at the time, and what we put out as new is usually an improvement over past info. I’ll forward this along to Dave and get his take.